What do you like to have when you are feeling sick..specially with cold, cough and fever, would you like to share? I'm in this condition now for 3 days and today being alone at home I'm in no mood to cook or do anything. Then around lunch time I started feeling little hungry, I have to take medicine too so I thought to make broccoli soup ..a plan which I happily kept postponing for almost a week now and also the broccoli was screaming on me to be consumed. I didn't follow any particular recipe, and just added whatever I feel like it but this is my normal way of making any soup ;). Serve - 4 cups appr. 1. Wash and chop broccoli stem and remaining into florets. Chop cabbage. 2. In a pressure cooker heat oil, add clove, cardamom, cabbage and give a good stir. 3. Add ginger-garlic paste and sauté for a minute. ~~ I actually wanted to use fresh ginger since I'm having cold but I didn't had any in hand ..
4. Add broccoli stems pieces, florets and sauté again for a minute. Add salt, peppercorns and 1 to 1.5 cups of water. Close the cooker lid and cook for 1 whistle. ~ I used 1cup water. 5. Once the cooker pressure is released & mixture is cooled, blend the cooked broccoli to smooth puree. ~~ Depending on how you like you soup to be..I added 2 cups of water. 7. Simmer the soup for 4-5 minutes or until a nice boil comes. Adjust salt if required. Garnish with spring onion or carrot. I added finely chopped carrot as it looks good and add good crunchy bites. ~ You can add onion and potato instead of cabbage. ~ I think adding carrot is good option too. ~ You can cook everything in a pan too but pressure cooker saves time. 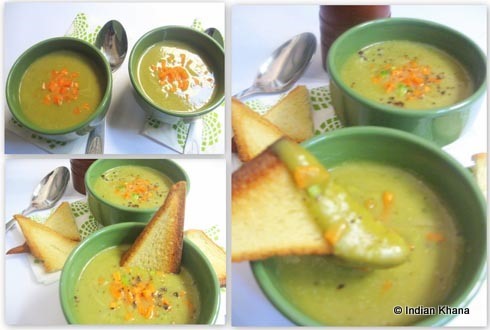 Take care Priti, soup looks so good and filling,nice clicks! I lost almost half of my body water as sweat and fever flew like it never happened. I never quit exercise since that happened. healthy and delicious..yumm..love the garnishing too.. The soup looks perfect. Good choice when you are not feeling well. 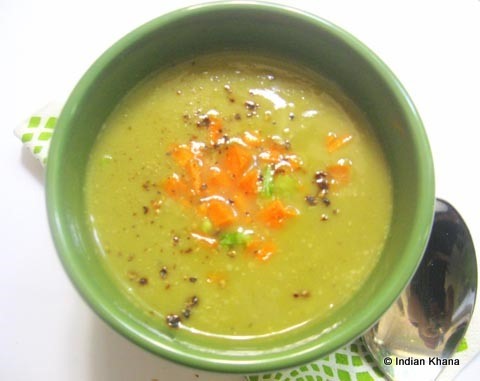 Soup looks fresh n greeny.First time to ur blog.Take care. 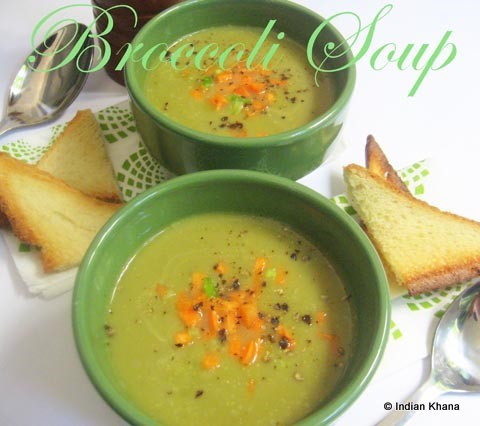 looks delicious n very tempting..
Looks truly comforting..;) Actually i have been searching for an easy to make & delicious brocolli soup for a long time...And ur recipe is perfect!!! The soup looks very comforting. Perfect for the cold rainy days..
Soup looks so yumm Priti. Take care. Get well soon dear...tk care! I love broccoli soup. It's one of my favourtie. It will be a prefect treat for this cold weather. The soup looks so comforting. I dont like broccoli much but this is one great way to have broccoli. get well soon. broccoli soup looks delicious. Get well soon Priti..A prefect and comforting soup definitely..
Boroccoli is a fav veggie in our family :-) the soup and it's color, so lovely ! Take care u r self. And really this soup will be good while cold. very nice attractive looking soup! havn't blog hopped for a while! Take care and get well soon! Soups rule! The soup looks so refreshing & healthy! Never been a great fan of brocoli but I know I must eat to stay healthy. So, this is coming as a great comfort to me Priti! Soup looks colorful, comforting and healhty too. Looks so superb and rich. Soup looks delectable! Get well soon..
Nice recipe..looks so delicious..healthy and yumm!! Hope you'll feel better soon, dear! 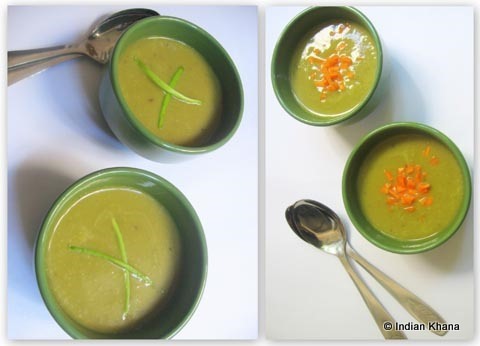 Broccoli soup sounds perfect: tasty and healthy! Soup looks colorful and yummy! Thank you for this recipe.Looks very yummy.